The Killers have revealed details for their highly anticipated new album, Wonderful Wonderful. The band's fifth studio album, and first in five years, will be released on September 22nd on Island Records. Produced by Jacknife Lee, it was recorded at the band's own Battle Born recording studio in Vegas, and at Jacknife's Los Angeles studio. Wonderful Wonderful is now available for pre-order along with an instant grat of brand new track "Run For Cover." "Run For Cover," a slice of classic Killers songwriting, is available now via all digital service providers. You can pre-order the album and limited edition deluxe merchandise bundles HERE. Following the release of blistering first single "The Man," The Killers played a surprise unannounced set at the Glastonbury Festival in June, sold out their British Summer Time show in London's Hyde Park in record time, and conquered the European festival circuit with a crowd pleasing set of almost two decades worth of hits. The band headline Friday night at Lollapalooza in Chicago, August 4th. Next, the band will be hitting the road in North America in early 2018 for their first full Killers tour since 2013, including stops at Brooklyn's Barclays Center and Madison Square Garden in New York as well as Staples Center in Los Angeles. Tickets for all shows will go on sale at 10 am local time on August 11, 2017, with pre-sales ahead of that to members of the band's fanclub, The Victims. For a limited time, each ticket purchase for the tour will include a copy of the album. 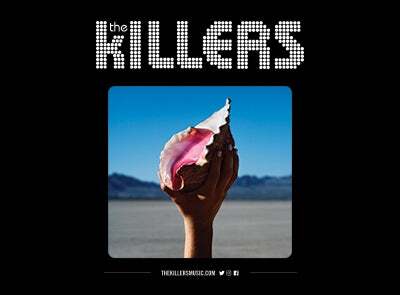 Check The Killers' website for further details. Wonderful Wonderful is the band's most sonically forward-thinking record, bursting with all of the blazing choruses and arena-pleasing anthems that make them one of the world's biggest and beloved rock bands.